Honestly, I haven’t thought that much about the New Kids on the Block in the past two decades. It would be weird if I did. 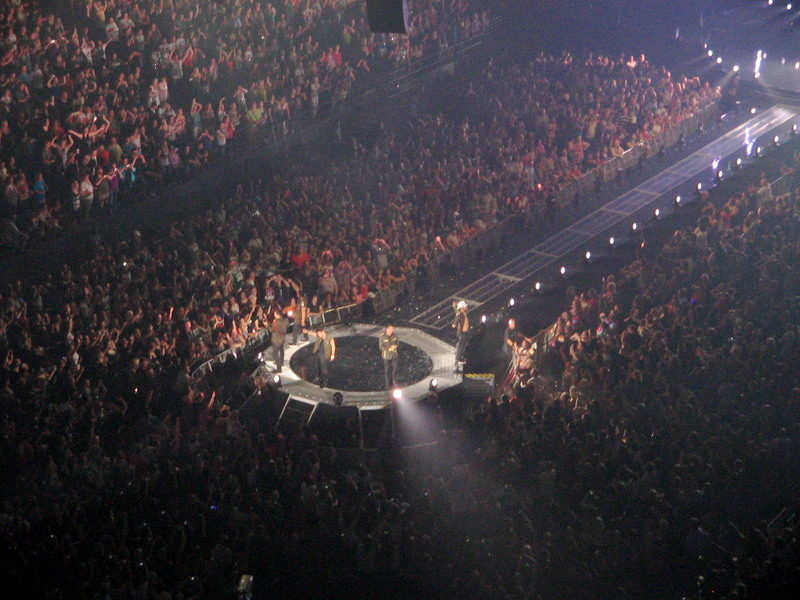 But you cannot unlove the things you loved before you were twelve, and I loved NKOTB, hard, from about ages 5-7. There’s a reason I never got rid of that t-shirt – and not just because my brother bought it for me (he was 9 and I was 5, how adorable is that?). 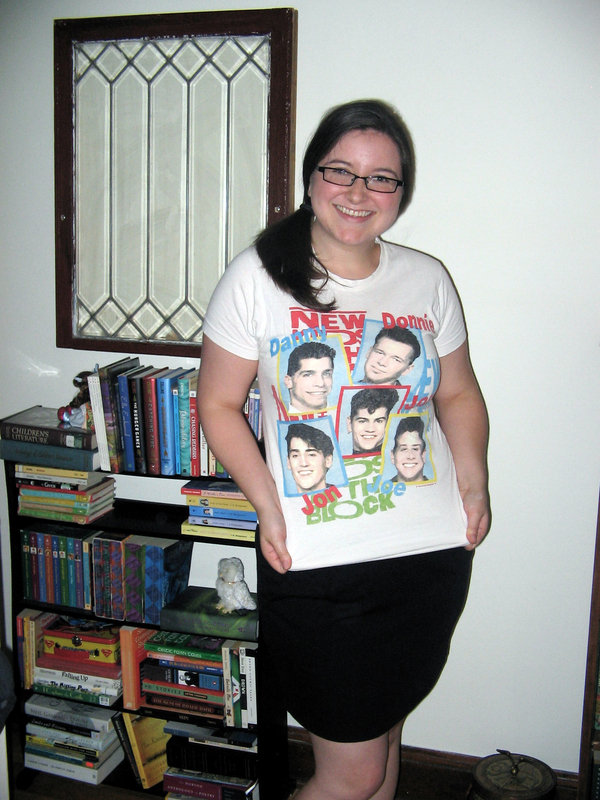 It was so I’d have something to wear 21 years later when I finally saw the, um, “New Kids” in concert. Once again not wearing pants; that's a skirt. It gets better, of course, since the men of my childhood dreams are on tour with the men of my teenage dreams, the Backstreet Boys. They have combined into some new entity called, and I still wonder if they’re kidding about this, “NKOTBSB.” Really guys? Are you sure you want to go with that? She could not resist those moves or outfits. Lacy and I arrived at the concert in time to see the opening act, Matthew Morrison (yes, the guy from Glee), which would have been more exciting if either of us liked Glee. And while he is amazingly talented, he was not in a boy band from our childhood, and couldn’t quite hold our interests. Instead, we people-watched and joked. Lacy posted a few of our choice statements on Facebook through her BlackBerry, and I thought, “this would be a great event to live-Tweet.” Unfortunately, I seem to like my cell phones like I like my boy bands: from the ’90s. My phone makes and receives calls and texts (most of the time), but that is the extent of its power; Tweeting was not an option. I’ve been thinking of upgrading my phone for a while now, as I live in a world where instant communication is expected and goes beyond just phone calls or texts. I’ve resisted out of a strong desire not to spend more money on something I’ve lived without so long (for a social-media-expert-in-training, I can be a real curmudgeon). I can check my email at home; I do not need to “check in” everywhere I go because if it’s fun or awkward I’ll just write about it here later; and GPS? Try a paper map from 1989 that doesn’t even include the Target Center. I’m all set! Right? 1) All of these dudes aged really well. Surprisingly well. I did not come into this evening expecting to develop a crush on Donnie Wahlberg, but these things happen, right? Donnie Wahlberg, commanding the Target Center with his abs. 2) I know all the words to songs I forgot existed. Good job, brain. You could be doing other things, like remembering your friends’ birthdays, but no, this is clearly a better use of your time. 3) Donnie wore a “Public Enemy” t-shirt, much like the one he wore in the “Step By Step” video, except glittery. Drink that in for a second. 4) I’ve never heard Howie from Backstreet Boys speak before, and it turns out he sounds exactly like the cartoon character Phineas from Phineas & Ferb. 5) Like every musician who comes to Minneapolis, both bands referenced Prince and yelled “Minneapolis” a lot. To which I say “I’m not from Minneapolis! Give some love to the right side of the river!” If I ever become a major pop star and play the Target Center, I promise to give St. Paul a shout out, too. And reference Prince. 6) There’s Jordan Knight again, SQUEEEE! 7) The Backstreet Boys wore white suits during “Show Me the Meaning of Being Lonely,” then threw the coats on the ground during “Incomplete.” White coats are for complete people! Or doctors! 8 ) Near the end (but before “Hangin’ Tough, much to Lacy’s annoyance), the Kids introduced the Boys and vice versa. This is a nice idea, but I’m fairly certain that if you’re at an NKOTBSB concert, you know the names of the band members. And possibly their birthdays, star signs, marital status, hopes and dreams as described to Teen Beat in 1989, etc. 9) 12 year old girls who are currently obsessed with Justin Bieber…we are your future. 10) This was so much more fun than I expected. Really, I bought the tickets out of a strong desire to giggle and experience ridiculous things, but the reality was even better. Oh-oh-OH-oh! What do you think? Was the Twitterverse at a loss without these deep thoughts on Friday night? If the New Kids on the Block can’t convince me I need a smart phone, who will? *At this point I should add that Lacy is a good sport, a great friend, and usually has way more “highbrow” tastes than me. But she also appreciates the silly side of life, which is how we’ve stayed friends for the past decade. Every generation needs a few good boy bands! “you cannot un-love things you loved before you loved before you were twelve.” So true. That is why I love the movie Labyrinth, pb&j sandwiches, and sidwalk chalk. Exactly! For me it’s also action movies and Aerosmith, but that’s just a different statement on my childhood altogether.